Where love makes and breaks the music. ‘Heavy Influence’ takes you on a heart-thumping journey through the trials and tribulations of a rising rock star who reaches unimaginable fame, yet the only thing his heart desires is having the love of his life by his side. Will this rockstar be able to get what his heart desires? To get our hearts thumping, Ann Marie Frohoff, the author of this collection, has set aside a few minutes to answer a couple of questions about Jake’s journey. Let’s start at the beginning, where did the idea for a collection exploring music, romance and fame originate? This book/series started with a dream after I took my daughter to a Jonas Brothers concert back in 2008. A dream is an interesting way to start a new writing project. What were some of the steps that came between the dream and the finished series? Initia,lly I began blogging for music websites – so I’d come to know certain musicians and bands. One young musician, Christo Bowman, of Bad Suns (he was 14 years old back then), he has become like a son to me. Being around him and his family in particular gave me inspiration, thought the drama in the book(s) isn’t about his family per say. Okay, so one of the first steps in the development was connecting with musicians through blogging. Yes, the Heavy Influence series of books is based on the real lives of the musicians I ended up touring with and befriending after “the dream”, as I wanted to immerse myself in my subject matter. Wow, touring with musicians must be fantastic fun, and of course completely invaulable to getting immersed in the musician way of life! Yes! If it weren’t for the guys in the bands I toured with, the books wouldn’t have been as authentic in voice, emotion and situations. Do you see these travels as something of a literary pilgrimage? Hmm. As in traveling for research? Then yes. The backdrop to every story I’ve written is connected to places I’ve traveled. I would imagine that you probably don’t have enough time to work on your writing as you travelled with these musicians, but were these travels at the forefront of your mind when you started the writing process in earnest? Yes, this goes back to the places I’ve traveled to and the people I’ve met and befriended along the way. What’s that saying? You’d better be nice to me, because you’ll probably end up in one of my books some day. hahahaha. *Laughs* No doubt with meeting so many people you’ve more stories in your head that you could ever write. What projects are currently in the works? Too many! I have no idea what writers block is, thank goodness. I’m currently working on my first urban fantasy, as well as something a bit mystical. Does your lack of writer’s block mean that you always find writing energizing, and never exhausting? I’m energized by writing. I LOVE it. How do you feel this love and energy has developed in regards to your voice as you’ve continued to tackle new and exciting writing projects? I’d like to believe it’s gotten stronger with each book I write and each round of edits that come along. As you reflect on the journey that you took during the Heavy Influence collection, what advice would you give to another writer looking to bulk up on their own strength? Make sure to hire a great editor. If you have to clean toilets to pay for one, do it. Invest in your work. Investing in your work is one of the best moves for becoming a better author. Ann Marie, thanks for sharing a little peak behind the curtains of ‘Heavy Influence’, and I hope to see your writing muscles flexed again soon with another new release! Excited to read the book we discussed today? Find it here on Amazon: ‘Heavy Influence – The Complete Series ( ASIN: B078N396FK )‘. 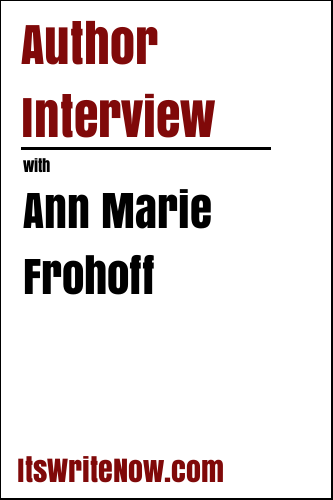 Want to find out more about Ann Marie Frohoff? Connect here!